Hi Members of Neogaf. I am a returning member and hope to stay here for a good while. I got banned for 3 days from the other site (Resetera) for saying someone is 'hot'. The ban reason was objectification. If this is likely to happen here please let me know. In my opinion its quite ridiculous to get banned for this reason and i hope this is not the standard at which gaming forums are now. If so then its a damn shame as in my opinion there is nothing wrong with saying someone is hot. Mods or members please let me know if that is going to be an issue going forward. In a disagreement, as long as you attack the arguments, not the person, you'll do fine. People whose only method of disagreeing with you is to insult and screech and whine, they don't stick around after a while. Yep. Understandable to be respectful of fellow members and provide good reasons for disagreeing adds more value to the discussion. Nah, you won't get banned for complementing people or things on this forum. Welcome aboard! I think you will find this place a breathe of fresh air compared to what you were accustomed to. Enjoy! Appreciate the helpful links and tips very much. Thanks. A few weeks ago I noticed that, in the thread list, the circle next to each thread's name is no longer the OP's avatar and is now just a simplified NeoGAF icon. Was this change on purpose? Yes, this was an intentional change. Lots of users complained about the avatars. This is causing the mobile them to extend. The toolbar (bold/italic...etc.) Isn't working on my phone (Android/Chrome), and it seems like first quotes and replys are getting dropped for myself and other users. Is there a way to turn off or get around the unread feature? 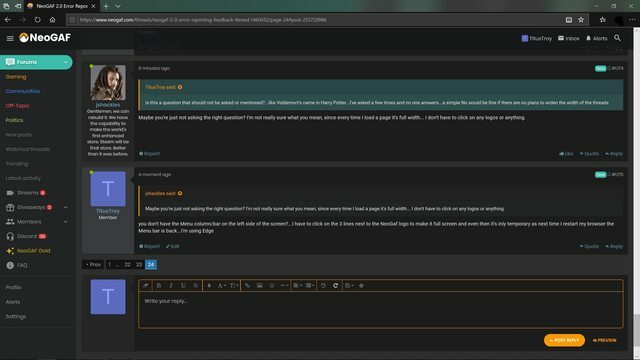 I made the mistake of marking the forums as read and now threads will take me to the last unread message, which is annoying when you want to read from the beginning. If you click on the "start time" under the thread title, it will always take you to the original post. Subsequently, if you click on the time of the latest post, it will always take you to the last post in the thread. Why can't i edit my post? There is no edit option. You have to be a full member. 1 month and 50 posts to qualify. I'd like change my CC in order to pay for Gold, but the only option available to me is 'Cancel'. This brings up a dialogue box, but otherwise nothing happens. No way to save the "toggle width" option in profile?.. Im not getting notifications when im mentioned it seems. Not sure if bugged. I’ve got this weird thing where all of a sudden most Youtube embeds on GAF give me a “video is unavailable” message. Usually you’d put this down to region locking, but it’s happening all the time now. I just watched a video on Youtube and it worked fine. I posted it on GAF. Click on it. “Video is unavailable”. is there a way to immediately go to the last page/post of a thread from the main thread titles page? i've found there are many times when I've read the first page/post of a thread, but am unaware that its on page 5 for example, and just want to skip to the last page/post to see where the threads current action is, vs. having to click into the thread and automatically be brought to my last unread post, for example page 2, when really I want to just go to page 5.
if not, anyway to implement that? are there any plans for threads to fill the width of the page without having to click the logo each and every time? Since GAF doesn't have access to your credit card details, the only way to accomplish this would be to cancel your membership (you'll still be a Gold member until your actual expiry date) and the once the subscription lapses you can re-subscribe with your new card details. That makes total sense. I will do so. Thank you! just throwing this out there - limit poll making. some users can't handle the power and responsibility. Maybe you're just not asking the right question? I'm not really sure what you mean, since every time I load a page it's full width... I don't have to click on any logos or anything. I had the same problem once. I think I had to tap the icon that looks like a gear to unlock the options. Oh yeah worked for me. But tapping the gear should disable them especially when the icon turns dark not bright. Other people have this issue too, right? It's been there for ages, possibly since the redesign went into place. Obviously, it's not that big of a deal, but it is kinda weird to see these weird ghosting trails pop up every time I scroll down the page. The picture doesn't show it all that well, but the lines show up on every thread of the site. It's a lot easier to see when you scroll, rather than looking at a static screen. 1. Restrict Neo Member in terms of how far back they can post a response. Any thread over 3 months say are out of bounds. 2. With threads over two years, perhaps a pop-up warning to let a poster know that it's an old thread they are responding to. Also, I realise [vis_name] got abused, but it's quite useful for opening posts. Maybe a way of restricting it to those only? Maybe this was already told, but I've made a quick look on the topic and didnt find anything. On mobile devices (smartphones) there are no notifications alerts. Is this normal? Try flipping your phone sideways and see if they show up. Yap, they do. Any way to make them show on portrait mode? I think it’s a problem that has existed for a while now. It’s been mentioned many times before. Hasn’t been fixed yet. Maybe it’s too hard to fix? I’m not sure. Notifications work fine on my iphone. I’m guessing yours is a non-Apple phone? Yeah, just tested on the companies Iphone and it works great. Hey is there an admin that can DM me? I have a question but I am not sure which avenue i can use to get into contact with one. Hello there, I've been trying to change my avatar but there seems to be a glitch with the upload system. When I upload a picture the name of the file will appear next to the upload button. But when I press save the file is removed and it act like I never uploaded a picture. I don't want to make a thread about it, but where can I find the 100pp option? I swear I've unwatched various threads plenty of times but sometimes still get resubbed back to them. This could be an error on my end, but I was looking for a simple 'search for thread' input at the top of the page. Or, how do you search for a thread by keyword? On mobile, I have to type in the search box at the top. Tap “go” on my keyboard. Then hit the search “back” button on the top left. That’ll take you to a more advanced search with more options. I'm on PC using IE, which may be the issue. No search bar at the top that I can see. I'll soon probably switch to Chrome... at work at least. Anyone else getting high CPU and GPU usage due to some ads here? Some ad for home insulation is causing my CPU and GPU usage to spike on both firefox and chrome (moreso on chrome is seems). If I get 2 of those ads on one page, it can get as high as 50% for CPU/GPU. Really noticeable on my low power laptop (i5-7200U based) and I pretty much have to block ads if I'm on battery power. On some other forums, I have noticed. Oddly enough IE seems to handle this particular forum regarding ads. You know what I kinda miss is being able to click on the number of posts in a thread and being able to see how many times I had posted in it. I did it the manual way tonight (search a thread for posts made by yourself and count them) to discover that I had posted in the Jussie Smollet thread 57 times. That's how I know how many times to flog myself. This new forum seems a lot heavier than the old one ... on my oldschool iPod Touch. I know that's my fault for using it But big pages keep crashing it that wouldn't have been a problem before. Is there any chance for the old "disable embed" option to come back? That'd mitigate it somewhat I think. I also think the buttons at the bottom of the thread on the old theme were much better too. Easy to press and with the jump to page option.